Unique opportunity to own a 1-bedroom, 1.5 bathroom apartment in a prewar condominium on Park Avenue in perfect move-in condition. 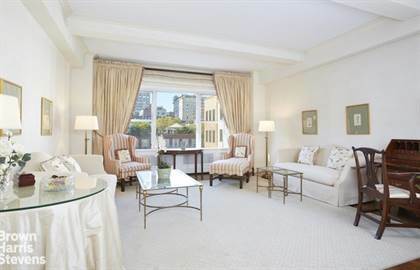 This sunlit 1191 square foot apartment has a gracious layout, oversized windows and 10' ceilings. Entered via a semi-private landing, this residence has a 12' x 10' gallery that also serves as a dining room for entertaining. The spacious 17' x 22' living room has three large west-facing windows that capture views of neighboring townhouses. The living room is outfitted with custom shelving and storage. The windowed kitchen has top-of-the-line appliances including Subzero and Miele, a breakfast bar and is conveniently located off the gallery/dining room. The west-facing bedroom has a generous windowed walk-in closet and a roomy windowed marble bathroom with a separate soaking tub and shower. The bathroom also has a stacked washer/dryer. Completing the apartment is a half-bathroom located off the gallery/dining room and a coat closet. The apartment has central air-conditioning. 944 Park Avenue is a 16-story condominium with just 23 apartments originally built in 1929. Residents enjoy a 24-hour doorman, gym, bike storage, and private storage. Located on Park Avenue in the low East 80's, this building is moments from Central Park, many museums, fine dining & shopping, as well as transportation.Showings begin Monday, April 15th. Hi, I'd like to find out more information about 944 Park Avenue. Thanks so much!